Below we present the names of some of the main representatives of iconography without of course exhausting the list of the large number of masters who served the art with humility, anonymously or not, small and big, whose names are written in the Book of Life. Saint Luke the Evangelist: Tradition mentions as the first iconographer, the Evangelist Luke. 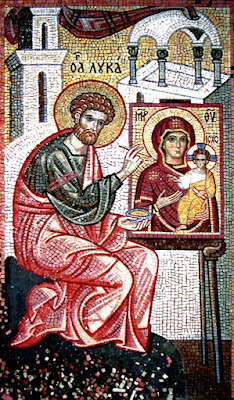 The Evangelist was the first to paint three icons - using wax, gum and colors - of the All Holy Theotokos, holding in her bosom our Lord Jesus Christ, and he offered them to her, wishing to know if they were pleasing to her. The Mother of the Lord accepted them saying, "The grace of the one who was born from me goes through me to them." Of these three icons, one is in the Peloponnese, in the Monastery of the Great Cave which is made with wax and gum. The second is said to be in little Russia, in a town called Vilina which was given as a gift by the Roman emperors to the Russians, so that they may be their allies. 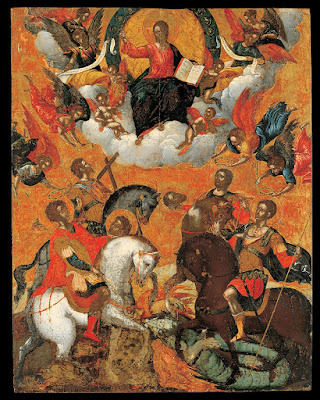 The third icon according to the assurance of the golden sealed decree of John Gregory Ghikas, ruler of Wallachia, is in Cyprus at the Monastery of Kykkos. Moreover according to tradition the Evangelist Luke drew some icons of the Holy Pre-eminent Apostles and some others, and since then the art of painting Holy Icons was passed on to good and pious people. Saint Lazarus the Confessor: He lived during the time of the iconoclast emperor Theophilos. Because he was an iconographer he was accused to the emperor and was subjected to severe tortures. The executioners placed on his palms on red-hot horseshoes and from the great torment he seemed as dead. The grace of God however protected him. Afterwards the empress asked Theophilos to free him, which was done. Saint Lazarus went secretly to the Church of the Holy Forerunner and lived there. While he still suffered from his burn wounds he drew the icon of the Holy Forerunner which performed many miracles. We celebrate the memory of Saint Lazarus on the 17th November. Saint Dionysios of Olympus: In his life the following is reported. While sitting with the rest of the monks he said, "Here come to us two monks," and taking a piece of paper he drew their faces, because he was very good at drawing, drawing one with a beard while the other younger. Truly the next day there came to the monastery two deacons. The first one who was bearded was called James, who remained and passed away at the monastery, while the second, younger, called Elias, became the abbot and later bishop of Platamon. Eulalios: He lived during the time of Justinian II (685-695). He painted the Church of the Holy Apostles in Constantinople. Heraclides of Byzantium: He was born in Constantinople, of unknown date. The early historians eulogized him saying that he stood equal to the early famous painters Apellis and Agatharchos. 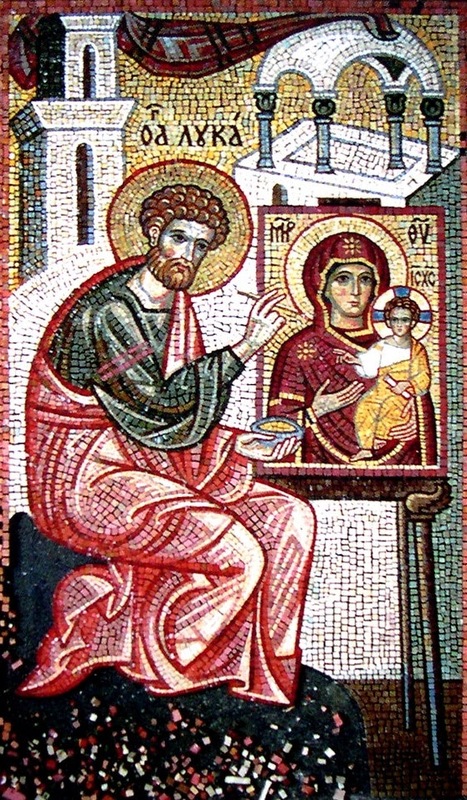 Paul the Mosaicist: He created a magnificent icon of Christ in the Church of Hagia Sophia in Constantinople. Monk Steven: He was a painter and confessor. 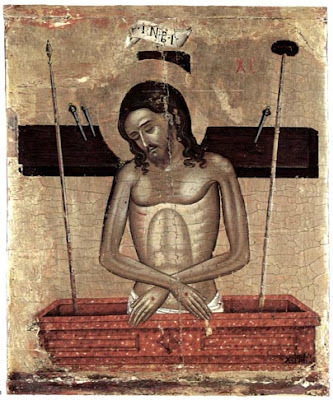 He suffered tortures during the time of Emperor Constantine Copronymos for his support of the holy icons. Andrew, son of Artavastos: He was the official iconographer during the time of Constantine Porphyrogenetos. It is believed he was of Persian ancestry. The Greek Iconographers from Constantinople: They painted during the 11th century, following a miracle, the Church of the Dormition of the Theotokos in the famous Monastery of the Kiev Caves, where they became monks, after the completion of their iconographic work. Paul the Iconographer: It is not known when he lived. He painted Saint George on his horse and his icon proved miraculous. Historians praise this artist by writing: "Paul the magnificent painter." Michael Astrapas and Eutychios: Both excellent painters. 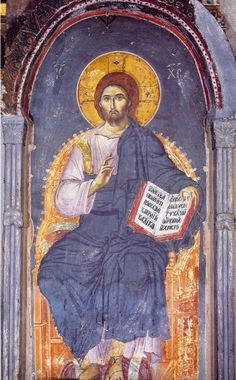 They came from Thessaloniki and did many wall paintings in many Serbian Churches. Of special mention is the Church of Saint George at Staro Nagoricane in Serbia (1313-1317). 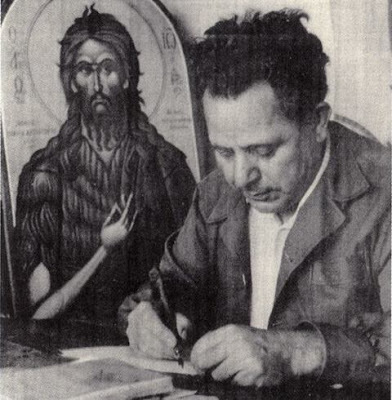 George Kalliergis: Official iconographer who painted the Church of the Savior Christ at Beroea of Macedonia in 1315 during the reign of Andronikos Palaiologos. Manuel Panselinos: Top iconographer of the 14th century and one of the most important representatives of the Macedonian School. Unfortunately no source was found to inform us on his life. According to tradition he was from Thessaloniki. Only Dionysios from Fourna in his manuscript "The Interpretation of the Art of Painting" informs us, that the iconography of the Church of Protaton at the Holy Mountain were of Mr. Manuel Panselinos. Dionysios further informs us about some portable icons of Panselinos, without however having any information on them. Finally, the iconography of the Chapel of Saint Euthymios at Saint Demetrios in Thessaloniki is believed to have been made by Panselinos due to the striking resemblance of the technique in relation with that at Protaton. 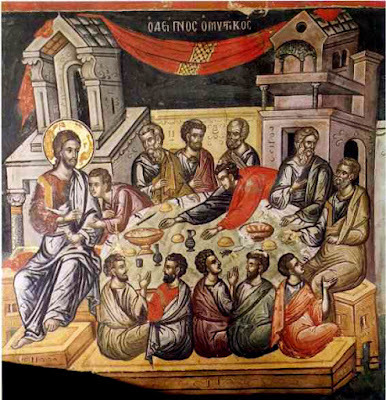 Nicholas Joannou and Kastrisios: They came from Kalambaka of Thessaly. 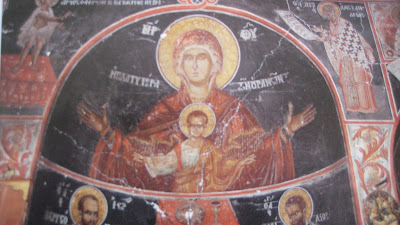 They painted the katholicon of the Monastery of Saint Steven at Meteora in 1501. Monk Theophanes the Cretan: Top hagiographer of the 16th century and the most significant representative of the Cretan School. Monk Theophanes Strelitzas, known as Bathas, must have been born in Herakleon in the last fifteen years of the 15th century and followed the family profession of painting. At an appropriate age he got married and had two children, Symeon and Neophytos. Then for some reason - perhaps due to the death of his wife - he became a monk. The first mention of the iconographer Theophanes is found in the inscription in the katholicon of the Monastery of Saint Nicholas of Anapafsa at Meteora in 1527. In 1535 he painted the katholicon of the Holy Monastery of Great Lavra at the Holy Mountain, where he settled with his two sons. In 1545, with a co-worker in his son Symeon, he frescoed the katholicon of the Holy Monastery of Stavronikita. Having lived for quite a few years at the Holy Mountain, he returned to his country Crete where he reposed on the 24th February 1559, the day he prepared his testament. His two sons continued his work. Anthony the Cretan: Austere and simple iconographer. 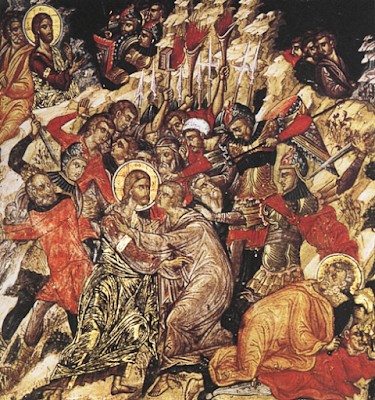 He painted the katholicon of the Monastery of Xenophontos at the Holy Mountain. Georgios Klontzas: Excellent iconographer, student of Theophanes the Cretan. He painted the katholicon (nave) of the Holy Monastery of Saint Dionysios in 1545. Priest Euphrosynos: He painted portable icons some of which are at the Monastery of Saint Dionysios of the Holy Mountain (Great Supplication, etc.). He lived in the 16th century. He was a very good artist of the Cretan School. Frango Catellano: He came from Thebes and is considered one of the best iconographers of the 16th century. He painted the Chapel of Saint Nicholas in the Monastery of Great Lavra of the Holy Mountain, as well as the katholicon of the Varlaam Monastery at Meteora. He came from the Cretan school but was been strongly influenced by the West. George, priest and sacristan of Thebes: Great wall painter who painted the narthex of the katholicon of the Varlaam Monastery at Meteora in 1566. Monk Daniel: He painted the katholicon of the Monastery of Koronis at Pindus in 1587. Michael Damaskenos the Cretan: He was born most probably in 1530-1535. There is little known of his life and activities and his dated icons are few. He was a magnificent artist and the greatest known part of his signed work is safely kept at Corfu. The existence of a large number of paintings by Italian artists in Crete influenced the Greek iconographers. So even this iconographer used Italian elements in his iconography corresponding perhaps to the wishes of his customers. Damaskenos enjoyed great fame and his influence on his contemporaries and succeeding painters was great. Iconographic forms that look like they were introduced or crystallized by him, became greatly popular and were copied until the mid-18th century. Emmanuel Lambardos: He lived in the beginning of the 17th century. He painted only portable icons in which a conscious ignorance of the works of Damaskenos and of Klontzas were noted and returned to the Palaiologian and early Cretan prototypes. Saint Nilus the Myrrhgusher: He was born in the Peloponnese to pious parents around 1601. At first he lived as a monk at Panagia Malevi, then went to the Holy Mountain. Having settled near the Cave of Saint Peter the Athonite, he built a cell with a church dedicated to the Reception of Christ, which he decorated with icons he himself painted. After his repose on November 12, 1651, his body emitted a beautiful fragrance. Angelos the Cretan: Great iconographer who painted only portable icons and lived in the early 17th century. Hieromonk Jeremiah Palladas: One of the most famous iconographers of his time. He was a Sinaite hieromonk but lived at Handaka, from where he came. He enjoyed great fame among his contemporaries, who considered him a great imitator of the "novices of early iconographers"; he taught the art to student iconographers. He was attached to the traditional style and rarely did he use Italian elements. He reposed before 1660. Priest Emmanuel Tzanes, also known as Buniales: He was born in Rethimno of Crete around 1610 and reposed in Venice on 28 March 1690. He was considered the most significant Cretan iconographer of the latter mid-17th century. Living at the time of the destructive Cretan war (1645-1669), he was forced to become a refugee. Crete was extinguished as a creative artistic center and painters departed mainly to Zakynthos and Corfu, from where some went to Venice. Sometimes he followed the Byzantine prototypes of the 14th and 15th century and other times he was inspired by western works following at specific times Flemish copperplate engravings. It is estimated that over one hundred works of Djanes have survived. Konstantinos Kontarinis: One of the most prolific iconographers of the first three decades of the 18th century. He lived in Kerkyra and followed in most of his works the style of Fr. Emmanuel Tzanes. Hieromonk Dionysios of Fourna: He was born around 1670 in the village of Fourna of Halkis. He painted portable icons but also wall paintings mainly in the Cell of the Holy Forerunner at the Holy Mountain, where he lived. He admired the works of Panselinos which he tried to imitate. He is considered one of the most significant hagiographers of his time, leaving behind his worthy students. Having deep desire to bring back the Byzantine tradition, which was declining due to the influence of the Western style, he co-authored the "Interpretation of the Art of Painting". Due to his attachment to the traditional prototypes, he suffered persecutions by his colleagues and was forced to leave the Holy Mountain. The precise date of his repose is not known. George Markou: His place of birth was Argos. He was a prolific wall painter, working in the area of Athens. He painted the katholicon of the Monastery of the Asomaton at Petraki in 1719. His last and most important work due to the plethora of the iconized Saints, was the wall painting of the Monastery of the Phaneromenis at Salamis in 1735. His students and the students of his students reached almost the end of the 18th century. Demetrios Zoukis: He came from the town of Kalarrytes. One of his works is the painting of the narthex of the Monastery of the Entrance at Meteora in 1784. John Anagnostis: He painted the katholicon of the Monastery of Spiliotissa near the village of Artsista Zogariu in 1810. Athanasios Pagonis Vrachiotis: He painted the katholicon of the Monastery of the Phaneromenis at Calliphoniou in the area of Karditsa in 1840. Vasiliοs Grevenitis: He painted the Church of Saint Nicholas in the village of Varyboby at Trikala in 1863. Saint Savvas of Kalymnos: He was born in Herakleitsa of Eastern Thrace in 1862. At 12 years of age he went to the Holy Mountain, to the Skete of Saint Anna, where he learned iconography. From there he went to the Holy Land and settled in the monasteries of Chozeba and Saint Savvas. Returning to Greece he formed a close bond with Saint Nektarios. After the repose of Saint Nektarios he enclosed himself in his cell for forty days to pray and fast, emerging with the first icon of Saint Nektarios. In 1926 or 1928 he went to Kalymnos and settled at the Monastery of All Saints, where he remained until his venerable repose in 1948. At the translation of his holy relic his body was found whole and preserved, emitting a beautiful fragrance and working many miracles. Photis Kontoglou: He was born at Kydonies (Aivali) of Asia Minor in 1895. After the death of his father, his uncle, Hieromonk Stephen Kontoglou, abbot of the Monastery of Saint Paraskevi, assumed his custody. He completed his schooling at Aivali and was a member of a team of students who were publishing the journal "Melissa", which Kontoglou used to illustrate with his drawings. He registered at the School of Fine Arts in Athens and then went to Paris in 1914 where he studied the various schools of painting. After many wanderings and journeys he finally settled in Athens. In 1923 he traveled to the Holy Mountain where he discovered Byzantine iconography and since then struggled for the revival of the art. During the decade of 1950-1960 he reached the apex of his iconographic effectiveness. He presented various exhibitions of paintings, he worked as a maintainer of icons in museums, and he was honored with the Academy of Athens Award for his book "The Expression of Orthodox Iconography", and generally he had a rich contribution in the area of art. He painted many portable icons and painted the churches of Zoodochou Pege (Life-Giving Spring) at Peanias, the Annunciation of the Theotokos in Rhodes, Panagia Kapnikarea in Athens and many more. He is considered the restorer of Orthodox Iconography and was a faithful child of the Orthodox Tradition. Contemporary iconographers owe him greatly. His students were even distinguished painters, such as John Tsarouchis, Nikos Engonopoulos, etc. He reposed on July 13, 1965 due to complications sustained in a car accident in the area of Phaliron.